What can I say about this model except, wow! This guy is amazing. It's the perfect example of using a Fantasy model for 40k. The transition is almost seamless, you wouldn't even think this started life as a Fantasy mini. It certainly helps that the Maulerfiend armor plates fit so well with the Maggoth Lord model. The flesh is painted in such a fantastically rotting manner. It really is convincing. Nothing shows off disease and bruises better then pale skin. I would have added a bit more rust and chipping to the armor myself, but it looks great as is. One of my favorite additions to the model is the use of the Maulerfiend mechanical tentacle as it's tongue. It mimics the original organic tongue so closely that it almost looks like it came that way. The mucus hanging off of it certainly helps too. Last but not least the base on this guy really helps to tie the whole thing together. The splashing of the water adds a sense of movement and weight to the mini while the, for lack of a better word, poopy color of it reinforces the Nurgle aspect of it. The only thing I would have added is something to show off the size of the Maulerfiend such as a skull near his feet. This model just has it all, with every part of it working together perfectly. Grandfather Nurgle would be proud. 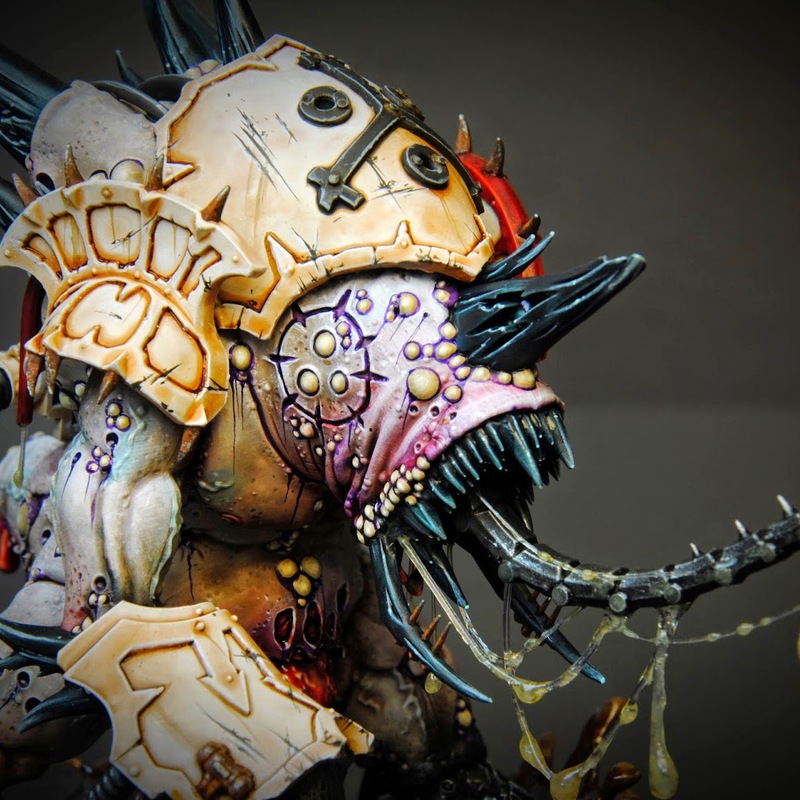 Be sure to check out more views of it on Blog de Kouzes as well as some in progress shots and tips on how he did certain parts of it. This is the first Mini of the Week that was suggested to me on the Forums, so thank you to user EdLo for bringing this guy to my attention! If you have a mini you think is worthy of being showcased go to the Mengel Miniatures Forum and post it in the Mini of the Week board. There is an event coming up sometime soon that any painter will be highly interested in with opportunities for awesome prizes and other cool rewards. You'll have to be a member of the forum to participate though. It's free to sign up and only take a few seconds, so why not join today?